The greatest RPG series for the XBox returns in Baldur's Gate: Dark Alliance 2 that once again returns gamers to the wondrous universe of Advanced Dungeons & Dragons. Its been over two years since the original game was released on the XBox and thankfully the wait is finally over, gamers can once again don their armour, weapons and adventuring equipment in order to defeat the nefarious forces of evil. The first thing gamers will notice about the sequel to the Baldur's Gate series is familiar yet different interface and this is mainly due to the fact that a new development company has taken over the series. Unlike the first game that was created by Snowblind, Dark Alliance 2 has been taken over by Black Isle Studio who are no strangers to the world of role-playing. Black Isle Studios were the development company that once again brought the world of Dungeons & Dragons back on the PC and console world with the original Baldur's Gate series and Neverwinter Nights to name a few of blockbuster gaming titles in their portfolio. Baldur's Gate: Dark Alliance 2 is your classic RPG game where players must fight their way through a plethora of dark minions, engage in a variety of missions, discover gold, wield powerful weapons and basically ensure that the world is free from tyranny. The unfortunate aspect of Dark Alliance 2 is that players cannot use their original characters and must once again create their own new avatars. Whether because of coding problems or the storyline, this is due to the fact that the original three characters have been captured and now it's up to a new generation of heroes to save the day. The story once again revolves around the Onyx Tower where a vampire named Mordoc has vowed destruction upon the city of Baldur's Gate. Fortunately for the citizens of Faerun (the Forgotten Realms), there are five heroes who have sworn their allegiance to the town and vow to bring justice back into the lands. Players get the chance to play one of five unique and different characters that include a human cleric, a human barbarian, a Drow monk, a dwarven rogue or a moon elf necromancer. As with the previous instalment, gamers can either play solo or with another player for some of the most addictive entertainment on the XBox in 2004. My choice character for the game was the human cleric who is not only an advocate for girl power but is also a powerful priestess of Helm that wields both the power of her god and that of man. The game starts as all good RPG titles do with your character being asked to assist a young woman in distress and as you progress through the game, you soon learn that more dark forces are at work here than the average garden-variety orc or hobgoblin. The reasoning behind choosing the cleric for this review is that she has access to both weapons (unlike mages) and the powers of the gods (like mages) so I could give this game a thorough and enjoyable review. Not only can my character fight her way into next week without breaking a sweat but she can also use the powers of the God Helm to assist her cause. Spells such as cure wounds to heal the damage caused by enemies or flame strike, to lay waste to evil by the fires of god were quite valuable in our journeys. The game engine of Dark Alliance 2 is brilliant and uses a combination of the analog sticks to control your character and camera angles with the right button pad used to attack your enemies, jump or cast spells. The gamepad was also used to switch between weapons and spells that cuts down fiddle some menus and adds to the gameplay of this title. Black Isle have also added a new feature into the game called the workshop that allows you to upgrade your weapons and armour but this can only be achieved if you discover enough rune stones so that the local shopkeeper can improve your items. The majority of gameplay within Dark Alliance is a huge hack and slash fest were you basically use your characters weapons and magics to defeat what appears to be a plethora of endless foes. Apart from defeating these foes, they also guard or wield ancient treasures that allows you to buy important adventuring equipment like potions of healing or recall. Characters that your characters can talk to, generally have a exclamation mark above their heads and by engaging these characters, you can learn rumours, get missions and basically talk about everyday things that is all part of RPG's. 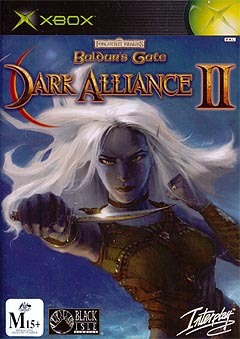 Graphically, Dark Alliance 2 uses a modified engine of the original game that has received a slight face lift. 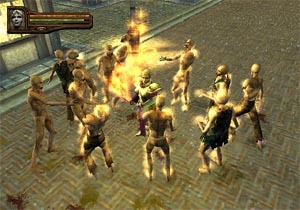 The characters in the game appear more polygonal than the previous game and when you encounter a non-player character, the gaming engine flawlessly zooms into the character. The only frustrating aspect about the gaming engine is the quite useless zoom on the camera angles, you can either zoom out a little or zoom in a little. It would of been nice if you could zoom all the way in to your character to see them get their hands dirty and zoom all the way out so you could get a better view of your character in regards to their environment. The developers have also included a variety of lighting effects from various day effects from morning to night to the way torches light up a small area of the screen. The beautiful water effects from the original game have also returned but unfortunately it looks a little strange on the XBox and is noway as impressive as the PS2 version water effects. Your characters and the characters that you encounter contain a high amount of polygons, move quite fluidly and contain some impressive texture details. The game also contains some extremely impressive pre-rendered cutscenes that quite simply look spectacular. An RPG game without majestic mood music or professional voice acting is a game missing a soul and fortunately Dark Alliance 2 contains both. The soundtrack of the game is brilliant and really helps you immerse into this fantasy world that contains some nice background music to the upbeat pace of epic battles. The voice acting of the game nicely suits every character that you encounter that doesn't sound too forced or contrived, even when they are hamming it up. 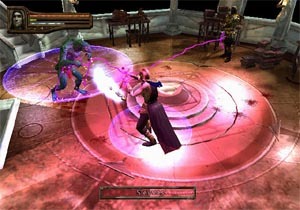 The game also contains a variety of sound effects from the sounds of zombies getting sliced open to the dark magics that your enemies wield, is all nicely integrated into the gaming environment. In conclusion, Baldur's Gate: Dark Alliance 2 is a worthy successor of the original and once again returns you to the magical world of the Dungeons & Dragons. With amazing graphics, a very sturdy gaming engine and an in-depth storyline, this RPG has it all... well almost. The only downside to the game is that the XBox version only supports 2-players and it would of been nice if this title supported XBox Live or even 4 players for some really exciting gaming. The developers have also brought new things into the game such as characters, weapons and different magics to not only pay homage to the original but also give gamers something new. If you loved the original, you'll love this and I suggest you all run to your nearest store and buy this game now!